RANCHO CUCAMONGA, CA. (January 16, 2019) – King of the Cage returns to Citizens Business Bank Arena in Ontario, California on Sunday, March 10, 2019 with a nationally broadcast event headlined by Flyweight World Title showdown between current KOTC champion Tony Gravely vs. undefeated Johnny Munoz. 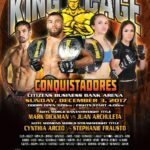 The co-main events will feature a Lightweight showdown between Jason Cordero vs. Fernando Padilla and Albert Veloz vs. Mauricio Diaz in a bantamweight bout.